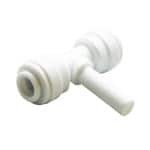 The John Guest branch stem tee 1/4″ x 1/4″ x 1/4″ comes in a pack of ten. These fittings are great to use on your main line if you are using bulk head fittings and they are fairly cheap. If you use this stem tee and the 1/4 to 1/8 npt stem adapter with a bulkhead you will have a very stable mount for your misting nozzles. Unfortunately if you are using a 3/8 mainline there is not a version of this stem tee in 3/8 x 1/4 x 3/8 so you will need to use a 3/8 x 1/4 x 3/8 reducing tee instead.